Two equipment sets can be associated with each role, for example PvE and PvP. Uses the game's built-in /saveequip sets (20 available). Replacement items allow you to reuse an existing set with minor modifications, such as a synergy crystal or trinket. Two wardrobe sets can be associated with each role. Custom macro text can be associated with each role. This can include any macro commands supported by the game, as well as commands for other addons. If KaruulAlert is installed, you can use drop-down lists to easily associate an alert set and subset with each role. You can assign custom names to equipment and wardrobe sets for easy identification. Menu uses role names you've assigned in the soul tree window. Role icons (tank/heal/damage/support) are automatically updated. Current role is displayed to show you which role is active at a glance. 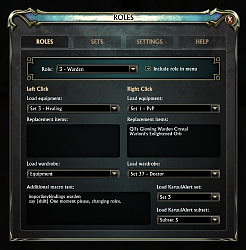 You can choose which roles to include in the menu, which lets you exclude test specs and infrequently used role slots. To add/update/review translations, please visit the localization page. After acquiring a new role slot, the KaruulAlert set drop-down list does not immediately update with the additional set. This will be fixed in the next release. In the meantime, you can type /reloadui to resolve the issue. Added support for an additional 20 wardrobe slots, for a total of 39. Added detection of KaruulAlert addon and drop-down lists for sets and subsets. Enabled scrollbar for longer select lists. Fixed error that can occur when opening role menu while zoning. Changed addon environment to Rift 2.6. Updated LibZormus to version 1.5. Fixed 1.8 error when loading the addon for the first time or acquiring a new role slot. Equipment and wardrobe sets can now have custom names associated with them. Equipment sets can now be loaded and saved from the configuration dialog. Wardrobe sets can now be loaded from the configuration dialog. Added option for showing/hiding menu background. Added German and Russian translations. Changed addon environment to Rift 2.5. Updated LibZormus to version 1.4. Improved behavior of text fields and select lists. Made minor adjustments to configuration dialog elements. 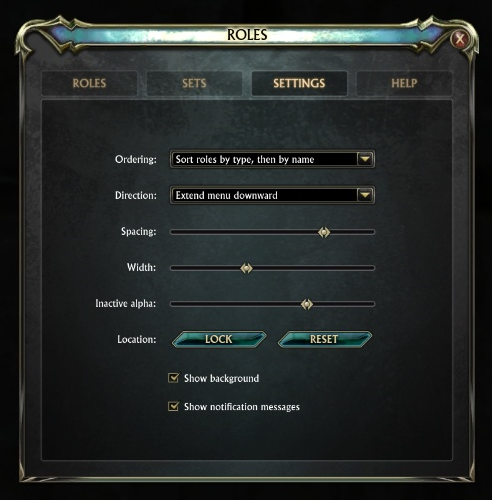 Enhanced handling of role type changes. Adjusted role macros for consistency. Changed addon environment to Rift 2.4. Updated LibZormus to version 1.3. Added support for new /wardrobe command. Added option for horizontal menus. Added a help section requesting localization for untranslated languages. Removed redundant close button from configuration dialog. Updated LibZormus to version 1.2.2. Fixed text fields to support all UTF-8 characters properly. Updated LibZormus to version 1.2.1. Added settings option for inactive menu alpha. Added settings option for enabling/disabling role change notification text. Added support for localization and added French translations. Increased maximum number of replacement items from 4 to 6. Changed name of height setting to spacing and changed default spacing for new users. Changed saved variable names to include addon identifier prefix. Made minor adjustments to dialog labels and layout. Updated LibZormus to version 1.2. Added settings option for menu height. 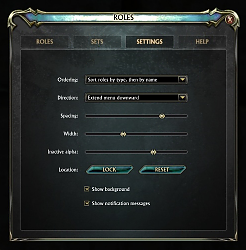 Fixed bug where changed role names and new role slots were not updated in config window. Prevent LFG tool group assignment from overwriting saved role icons. Addon now supports 20 equipment sets. Updated welcome message to include version number. Fixed open drop-down list image when dialog closes. Fixed console error that occured for some users. Updated LibZormus to version 1.1.2. Fixed addon error that would occasionally occur upon loading. Updated LibZormus to version 1.1.1. Role change notifications are now sent to all chat tabs that receive system messages. Added color-coding to role change notifications based on role type. Config window now automatically selects current role when opened. Fixed a bug that caused menu to become active when leaving combat while config window is open. Updated LibZormus to version 1.1. Middle-clicking the menu button now opens the configuration window. Configuration window now retains its location during the session. Clicking on the checkbox label now checks/unchecks the checkbox. Updated LibZormus to version 1.0.1. Fixed addon error that occurs when resetting a role. Fixed issue with text fields overlapping select box drop-downs. Fixed addon errors for characters with one role. In light of the wardrobe changes coming in Rift 3.2, I will be removing most of the new features originally planned for version 2. Wardrobe slots will no longer provide actual storage, so there is no point in having the addon save and load its own equipment sets. Item tooltips and set listings are nice to have but not worth the added complexity of having two equipment modes. In summary, all changes related to enhanced mode will be reverted. 2.0 will be the same as 1.9 with minor bug fixes and the following additions: the ability to manually assign role icons, new [left] and [right] modifiers for custom macros, and some configuration window enhancements. The 2.0 beta has been temporarily removed from the download area. I'll put up a new version of the beta after making the necessary changes. Last edited by topiland : 08-08-15 at 03:24 AM. Edit: 2.0 beta is now available at the above link (more information). Last edited by Zormus : 02-17-15 at 05:43 AM. Is there a way for the user to disable the middle mouse button from opening the configuration screen or b) is there a prior version I can use that will not cause the configuration screen to open? There isn't a way for the user to disable the middle-click functionality at the moment. The feature was added a long time ago so there isn't a previous version available that didn't have the feature. The best you can do for now is to maybe move the button somewhere off to the side so that you don't accidentally click on it as much, or use the button width option to resize it so that it is smaller. Hi. Great add-on, I absolutely love it! 1. My main spam button is middle mouse button. 2. During warfronts, this causes the configuration box to pop open constantly. 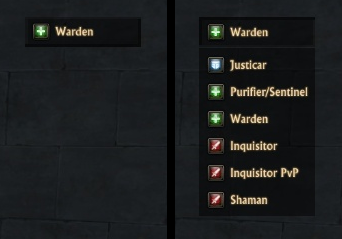 Support for the 20 additional wardrobe sets that will be added in Rift 2.7 (39 total). Drop-down lists for KaruulAlert sets and subsets. These are a convenient alternative to putting the commands in the macro area, and are active only if you have KaruulAlert installed. Thanks for the bug report. I have fixed the issue and uploaded a new version. All users, please download 1.8.1 for the bug fix. Last edited by youtube : 01-23-14 at 01:26 PM. Version 1.8 is now available for download. You can now assign custom names to equipment and wardrobe sets. These names are displayed in the drop-down lists so you can easily identify which set is which. Equipment sets can now be loaded/saved by clicking a button in the configuration dialog. Some may find this more convenient than typing out the /loadequip and /saveequip commands when updating sets with new equipment. Wardrobe sets can also be loaded from the configuration dialog. There is a new option to give the role menu button a transparent background when not being moused over. The addon now supports German and Russian in addition to English and French. Thanks to all the translators who contributed to the localization effort! The roles bar disappears again and must be reset if. what can be done against? 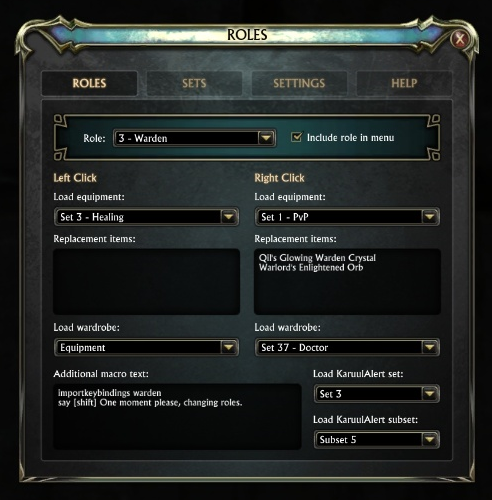 The role menu should stay in the same position from session to session. If you have somehow moved it off-screen or have changed your screen resolution such that it ends up off-screen, you can type "/roles reset" to move it back to the center. Or, if you are referring to the menu fading in combat, you can adjust the fade level in the settings. If you are referring to another scenario entirely, please give a more detailed description of your problem and I'll see if I can help. Support for Rift 2.4 patch. Version checking functionality: if a newer version is detected, the welcome message which is displayed when the addon loads will include this information. You can also go to the "help" tab to see if the addon is outdated. Text fields will appropriately lose focus when clicking elsewhere in the configuration window. Select lists will appropriately close when clicking elsewhere in the configuration window. Support for the new /wardrobe command. 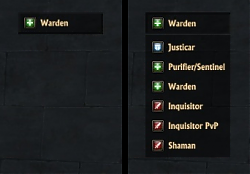 You can associate two wardrobe sets with each role (left click and right click). A new option to extend the menu to the left or right. To keep menus from getting too wide, only icons are shown in horizontal menus and role names are displayed in a tooltip as you mouse over each icon. The spacing setting controls either horizontal or vertical spacing depending on the menu orientation. Last edited by Zormus : 08-14-13 at 02:17 PM. This version also adds support for localization. French translations are now available (thanks to Cé[email protected]). German, Korean, Russian, Simplified Chinese, and Traditional Chinese translations are still needed. If you would like to help translate the addon into your language, please visit the localization page. Edit: Version 1.5.1 is now available and includes a fix for UTF-8 support in the text fields. Last edited by Zormus : 07-29-13 at 08:31 PM. Edit: Just noticed you are the same person that asked about localization before. I'm happy to report that the changes for localization support are almost finished (planning to finish them this weekend). Check here again in a few days for info on how to submit translations. Yep it was me asking about localisation. And for the number of lines in replacement items i know i could use another saveequip but since you got 6 lines for macro commands i though having same number for item replacement could be possible. About the localistion i could start posting here some of french translations right away as i got rift opened. anyway i did pm you on curse. Last edited by Ceres : 07-26-13 at 06:11 PM.